By 1480, after more than one hundred years the choir, transepts and nave of Milan Cathedral had been vaulted. But the most difficult task was yet to be completed. The raising of a tower 50 metres high on narrow piers of only 267 centimetres wide at the crossing of the transept was a formidable structural problem. The placement of a structure of such extreme height on such slender supports presented an enormous challenge. 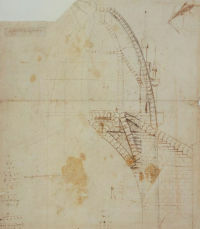 Between 1487 and 1490, Leonardo pondered the problem. Codex Atlanticus Fol 850r shows one side of the crossing of the transept, between two piers. The section cuts through the large arch joining the piers, the wall built over this arch and the wall erected over the arch of the side aisle. To give rigidity to the overall structure, Leonardo specified stones that would fit into one another in the mode of interlocking vertebrae. In this drawing the individual blocks are represented with anatomical precision. The drawing brings out wonderfully the interplay of forces. In the mode of a skeleton, the structural members alone are weight-bearing rather than the mass of the wall.